Takasago International Corporation was founded in Japan in 1920. For more than 80 years, Takasago has developed flavors and fragrances for some of the world’s most successful food, beverage, fine fragrance, household and personal care products. Takasago is a leading global company especially in the Asian region. The global Takasago organization maintains offices, production sites and R&D centers in 24 countries. Through our network of global research, production, creativity and marketing, we develop products tailored to the needs of individual markets. 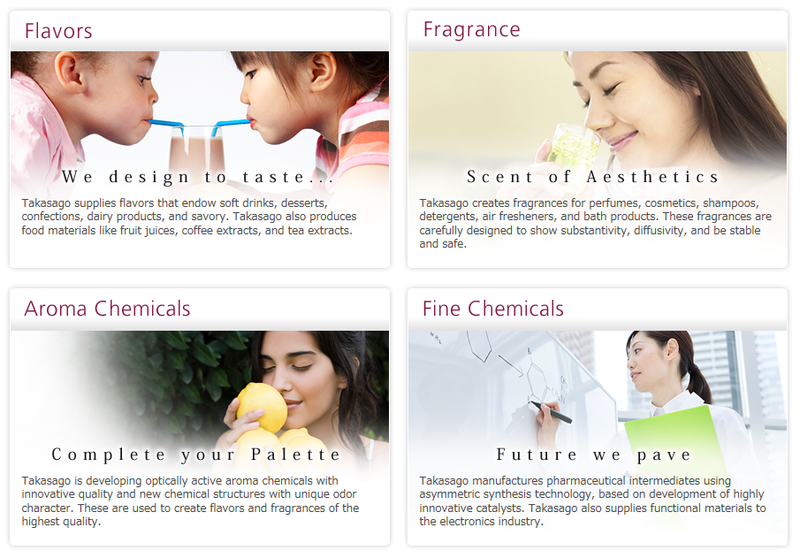 Takasago has four business divisions: flavors, fragrances, aroma chemicals, and ﬁne chemicals. By effectively harnessing the Group’s management resources in each region, Takasago brings our customers across the globe high-quality products and services they can trust. About 5,000 types of new products are reportedly launched on the Japanese food market every year. This market is where the world’s largest assortment of products is being developed. TAKASAGO supplies various flavors and extracts for well-known food brands, in Japan and around the world. Using advanced technology, we continue to be at the forefront of this industry. TAKASAGO’s superb product development capability is highly evaluated by the users. Takasago International Corporation was founded in 1920 as Japan’s first manufacturer of aroma chemicals. With over 80 years of experience, TAKASAGO has been playing an active part in the world’s flavor and fragrance markets, in line with our spirit of “Based on Technology”. In the 60′s, representative offices in New York and Paris were established as regional base, where we entered the fragrance and aroma chemical markets, and steadily established our operations in the regions. Takasago expands the realm of possibilities in aroma chemicals through its own original technology of asymmetric synthesis and wide-ranging applied research. By developing innovative synthetic aroma chemicals, we expand the perfumers’ and the flavorists’ palette of materials for their newest creations. Fine chemicals Division of Takasago International Corporation is developing and producing important intermediates supporting life science and electronics industries with our core technology – Catalyst. Since our success in commercialization of l -menthol with asymmetric catalytic synthesis in 1983, our creative and original researches have contributed to variety of industries as a pioneer of homogenous catalyst. Although overseas sales already account for nearly half the company’s sales, Asia outside Japan accounted for only 17 billion yen ($166 million) or slightly more than 10% of global sales in fiscal 2013. “It is important to cater to local palates,” said Satoshi Masumura, who became president of Takasago in May. He said no place in the world rivals Southeast Asia when it comes to the diversity of consumer preferences, which makes the region an ideal testing ground. Tokyo: Takasago Fine Chemical Division has received the 2014 Global Supplier Award from Eli Lilly and Company. The award recognizes exceptional efforts of suppliers through the management of projects, process improvements and valuable proposal. Takasago International Corp., with headquarters in Tokyo, Japan and annual revenues of $1.2 billion, global operations in more than 20 countries and 3,000 employees worldwide, is one of the largest Chemo Catalysis Fine Chemicals companies. Takasago offers catalyst screening, optimization, and customs synthesis from preclinical through commercialization. Takasago Fine Chemicals has been working on Chemo Catalysis for over 30 years and has over 500 catalysts for Asymmetric Hydrogenation, Transfer Hydrogenation, Ester Reduction, Acylation, and C-C coupling reaction. All catalysts are commercially available and non-exclusive royalty free.